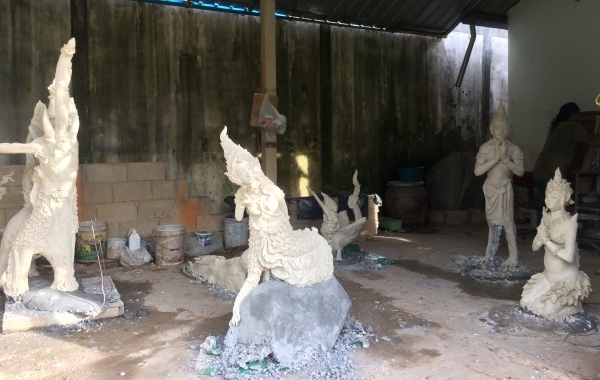 For Thailand Biennale,Richard Streitmatter-Tran collaborates with a Krabi-based sculptor, Visarnsak Savangkaew, to explore the complexity natural materials. Inspired by the mythologies of Manohara, the Kinnari who is the half woman, half bird heroine in Jataka tales, the two artists generated Anima. This work is a group of nesting sculptures in the shape of various animals that have at their core, figurines of the Kinnari goddess. These human/ animal hybrids reflect the important yet fragile relationship between humans and the animal world. As the sculptures stand by a waterfall in Krabi for the duration of the Thailand Biennale, the outer layers of the sculptures are expected to eventually peel and fall away due to the rain, wind, and sunlight, revealing the mythical Kinnari inside.